Who is Mosaic Erie, and why should you read this case study? Mosaic Erie was established in October 2017 by Chris & Christine. 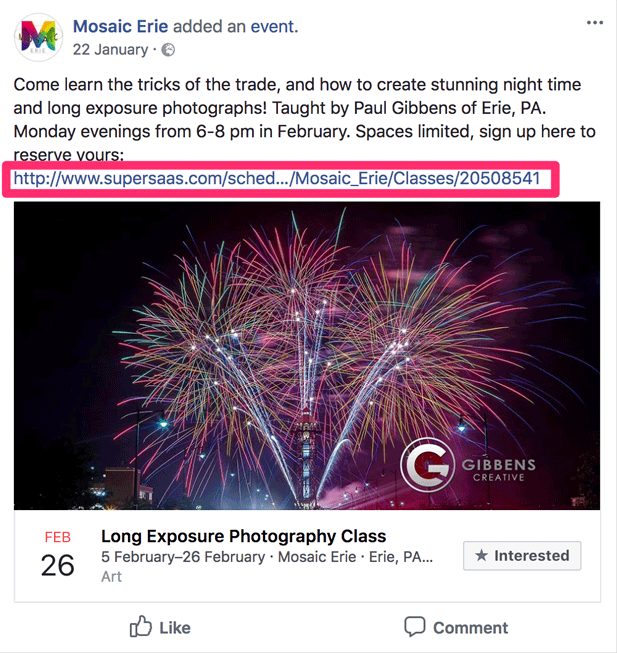 Mosaic Erie (MoE) was started as a group photography studio to solve the problem of renting space for short durations of time and to allow individuals or small businesses space to utilize the shared space for conducting classes/workshops. 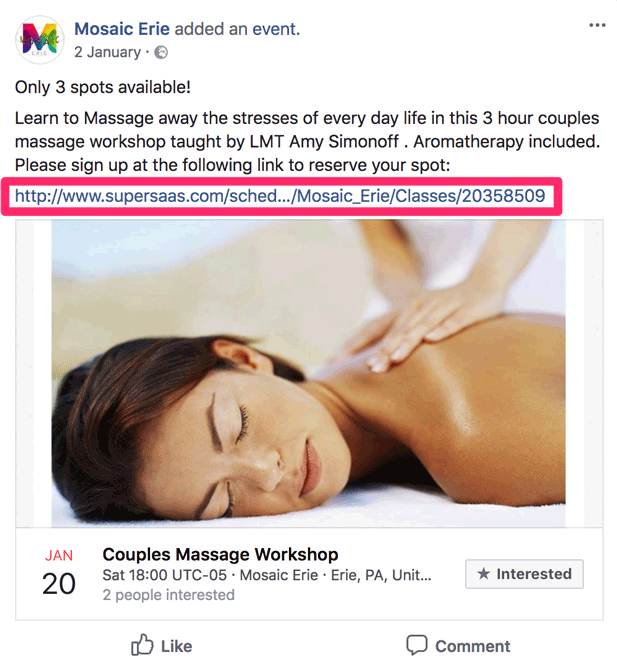 This is the story of how MoE used the SuperSaaS online appointment booking system to automate their booking procedures and increase business efficiency. If you want to understand how to develop your own online booking schedule for your classes, workshops, events, or space rentals, you will find all the necessary steps listed below explaining how you can adopt the SuperSaaS online appointment scheduling system to automate your business. Why was Mosaic Erie searching for an online scheduling system? Within a few weeks of starting up, MoE started receiving a flood of queries regarding room availability, rental pricing, booking procedure, class timings, and seat availability. As the number of bookings increased, the task of managing class schedules manually via telephone and email became burdensome and time-consuming. This growing overhead led MoE to investigate automating their complete scheduling process. 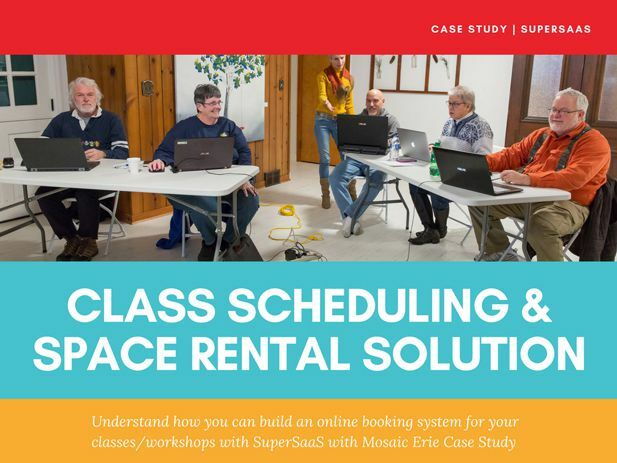 After reviewing their options, MoE adopted SuperSaaS for their online appointment scheduling software in order to manage their class bookings and space rental solution. The ultimate goal: to make their booking system flexible, easy-to-use, and more transparent. The first step of solving any problem is to understand the exact issue and identify possible solutions. MoE determined the best possible solution for their problem was to create two separate scheduling systems. First, a schedule to manage individual bookings for shared space. And second, a schedule for students where they could view and book the available classes and workshops. SuperSaaS offers three types of schedules to cater for different uses, situations and businesses. Selecting the most-suitable schedule for your requirements is one of the most important steps when setting up the SuperSaaS system. Space Rental Schedule. A resource schedule is a schedule organized around individual people or events. 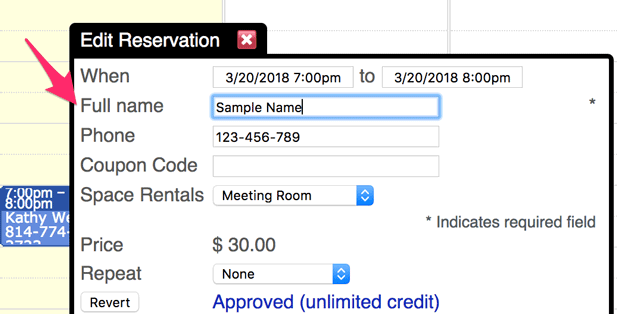 Because the space available for reservations is a limited resource and available only for specific periods of time, MoE created a resource schedule as a space rental solution. Class/Workshop Schedule. A capacity schedule is a schedule which works best for group events such as classes and workshops. Each of MoE‘s classes/workshops has a different price with a different registration capacity, and so MoE created a capacity schedule for class and workshop management. Should the users be permitted to make repeat bookings or not? Are the users allowed to join a waiting list in case a reservation is canceled? What are the opening business hours? Do bookings require payment or approval? Can the user apply the discount code to get offers? Should new appointments be confirmed? To whom? How often should MoE share reminder and follow-up emails? Where is the user redirected once the booking is complete? SuperSaaS offers fine-grain control over each of these aspects of the booking process, and MoE would answer many of these questions to create a well-defined process flow for their SuperSaaS calendar. Once customizations for space rental schedule were complete MoE proceeded to create the second calendar for scheduling student classes and workshops. To accept payments from users for the classes and workshops, MoE set up their payment solution for online payment collection mode. Experimenting with the flexible payment methods of SuperSaaS, MoE customized their payment section to offer packages for specific items and exclusive discounts & promotional offers to attract new users. Within a few hours, MoE transformed their entire booking process into a completely automated, professional, and easy-to-use online booking system. The scheduling process is now more clear and straightforward for the MoE team, the individuals/businesses, and for the students. Moving their appointment bookings to an online system now allows MoE to provide greater flexibility to their users and 24/7 availability. MoE has also seen cost-saving by up to 80% thanks to improved information-sharing at the right places, an increase of time efficiency by up to 20%, and overall business growth due to conversion and outreach tools such as email reminders reducing no-shows. SuperSaaS is an online appointment scheduling application that is flexible, accessible, and highly customizable. Some of the most important features include quick & hassle-free bookings, user-friendly customization, mobile compatibility, integrations with Google Calendar and Outlook, and payment processing. SuperSaaS can be used by HR professionals, schools, universities, sports clubs, photographers, therapists, medical institutions, pet care institutions, coaching and similar instruction-based businesses, yoga teachers, cooking schools, tours and travel businesses, auto maintenance, fitness and recreation companies, hotel/guest bookings, financial services, and much more. You can download the complete case study to see the detailed step by step procedure of how MoE used SuperSaaS to set up their booking system. Sign Up for your free trial today to find out more about how SuperSaaS can benefit your business.